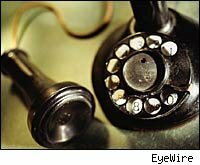 Add old-fashioned phone lines, known as land lines, to the list of soon-to-be-extinct things that still have plenty of value. Verizon (VZ) agreed to sell 4.8 million land lines to Frontier Communications (FTR) for about $8.6 billion in stock and cash yesterday. Verizon wants to focus on its growth areas, and while land lines may be a dying business, Frontier sees value. Like the jumbo-shrimp oxymoron, it makes perfect sense while making no sense at all. There is no doubt newspapers are going the way of the bow tie, soon to be a novelty. Kids will look at a faded newspaper years from now commemorating Barack Obama becoming president and instead of saying, "Wow, cool," most kids will say, "Why did they waste all of that paper to print the news back then?" The question is, does that comment happen in 10 or 20 years? While media companies figure out how to make money without paper, delivery trucks and printing presses, someone will gladly buy those businesses -- at the right price, of course -- and milk the cash cow for every drop it will produce in the ensuing years. I work across the street from a Blockbuster (BBI) Video store, which by most accounts should be dead and buried by now. But it's still there. Lots of videos, old and new, for rent and for sale. People go into Blockbuster and come out with movies, popcorn and soda to take home. Every day. The blue and yellow DVD boxes have replaced the blue and yellow VCR boxes. The customers, though, haven't all been replaced by Netflix (NFLX), downloads and on-demand movies, as predicted more than a decade ago. That's why Frontier bought the lines from Verizon. As more people ditch their land-line home phones for cell phones and offices replace land lines with digital ones, there's still plenty of people who go home, pick up their phone, listen for the dial tone and start punching buttons to make a call. Without veering off into why phones that don't run on electricity, or movies you don't have to download onto your hard drive still have value, the point is, while declining, there's value. Declining value is why Microsoft (MSFT) is trading under $20. Because some think its Windows operating system and Office suite software will not be needed soon. How soon? I don't have a crystal ball, but I'd bet so-called "cloud computing" doesn't displace Mr. Softee as soon as most tech analysts say it will. Windows is a goose that continues to lay billions of golden eggs. Investors can shake Microsoft CEO Steve Ballmer, point to newspapers and say, "Look what's going to happen to your business. Do something, quick!" Ballmer can shout back, "Hey, newspapers got 'hip' and started giving away their news for free and look what happened to them!" While Microsoft might be following in the steps of newspaper companies by milking its money-makers for all they're worth, there will come a day when folks call their software valueless. If Microsoft agrees and sells to pull out its remaining value, someone will buy it, as long as there are still customers who want the product. Should Electronic Arts (ERTS) start giving away copies of Madden NFL 2010 because people will soon be downloading it instead of buying it at Gamestop (GME)? Not while folks are willing to plunk down their Visa (V) cards to take home The Sims. Frontier will take those land lines, thank you, Verizon. There were plenty of folks reading The New York Times (NYT) and Post on the subway this morning, who used dollar bills and quarters to buy those newspapers. While the second rule of business might be to innovate, retool, and repeat, the first rule of business is to make money. While technology is the future, people are still willing to pay for what works. I'd love to write some more, but I have calls to make. My Voice over Internet Protocol (VoIP) office line has been down for hours today, so I'll have to use the pay phone outside of the Blockbuster store. Anthony Massucci is a senior writer and columnist at DailyFinance.